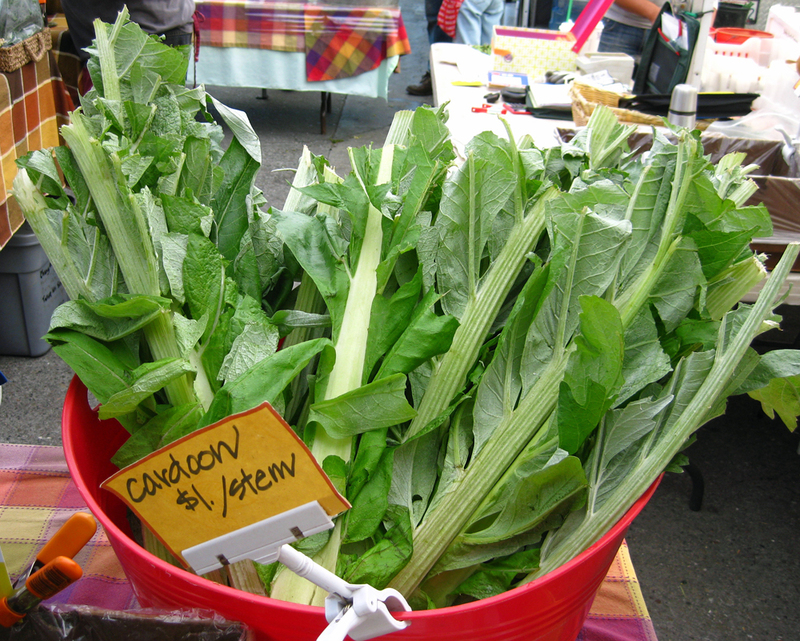 A bushel of cardoon at the farmers market. We ventured out to the Ferry Building Farmers Market last month with visiting parents in tow to grab breakfast and browse the stands in search of something interesting to serve with brined pork, from our 4505 butchering class. We grabbed some asparagus from Zuckerman’s Farms (dad’s favorite spring veggie) and what has to be a too early to be real “heirloom” tomato (we’re suckers for a big, meaty tomato). As we strolled through the stands, we saw a bucket brimming with big, wild-looking stalks of cardoon, a vegetable we’d seen at the market and on menus over the years but had never tried cooking at home. This Mediterranean thistle, and relative of the artichoke, was domesticated eons ago. It shows up in dishes throughout Mediterranean Europe, usually braised, often added to soups, sometimes deep fried. Enzymes in cardoon stamens provide a vegetable source of rennet used in cheese making in Portugal and Spain. Cardoon’s flavor is subtle like artichoke-as you might expect. On its own, it isn’t terribly interesting. The vegetable provides a nice textural backdrop to some of our favorite flavors and textures – cheese, butter, cream, mayonnaise, garlic – but pungent herbs like rosemary, thyme and oregano would likely overwhelm its delicate flavor. 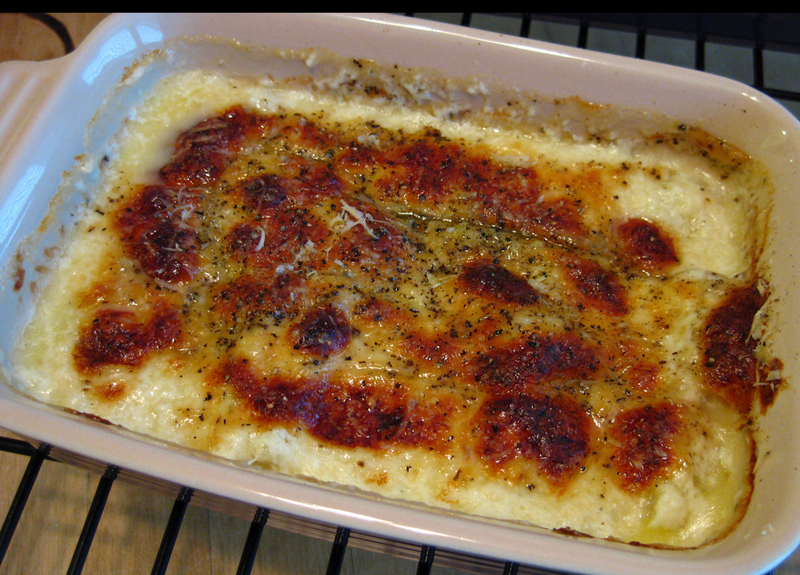 After scouring the web and our cookbooks for inspiration, I settled on a gratin of cardoon. A gratin is a simple, efficient choice for any number of veggies and, in this case, a good use of leftover sauce béchamel sitting in our fridge. I made due with a single stalk, but more would have been better. After removing the leaves and most of the largest stringy fibers from the outside of the stalk, I cut it into two-inch lengths and blanched the pieces in salted boiling water for about 10 minutes. I could have sautéed them in butter or olive oil with a little garlic and red pepper flakes, but I wanted something richer. I set the pieces in a single layer on the bottom of a small baking dish then spooned the béchamel over the cardoons, sprinkled the sauce with a good helping of micro grated Grana Padano and freshly ground black pepper and then popped it into the toaster oven for about 20 minutes at 375 degrees. The dish emerged with a beautiful golden brown crust. The cardoon pieces retained their texture and though they were perfectly tender on the fork, they were still pleasantly crunchy and toothsome. We may or may not look for them the next time we’re in the market, but we’re happy we finally gave this new old veggie a try. Next, soup! « Older Post The Ear of the Pig	» Newer Post Go Yogurt! The flower buds of it can be eaten much as the artichoke, more often the stems are eaten after being braised in cooking liquid. That’s a great tip! Thank you for the suggestion. I tjink this is one of the most vital info for me.